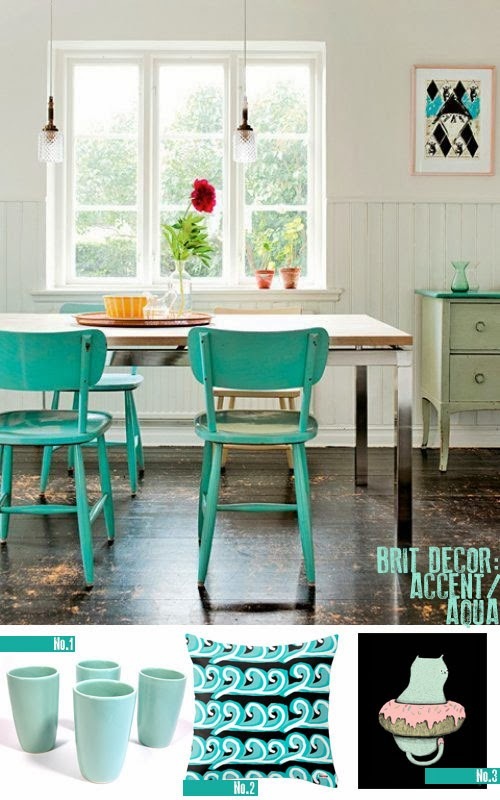 Accent colours are my favourite means of adding detailing to a room. They can alter the entire feel of a space and all through a mere flash of colour. 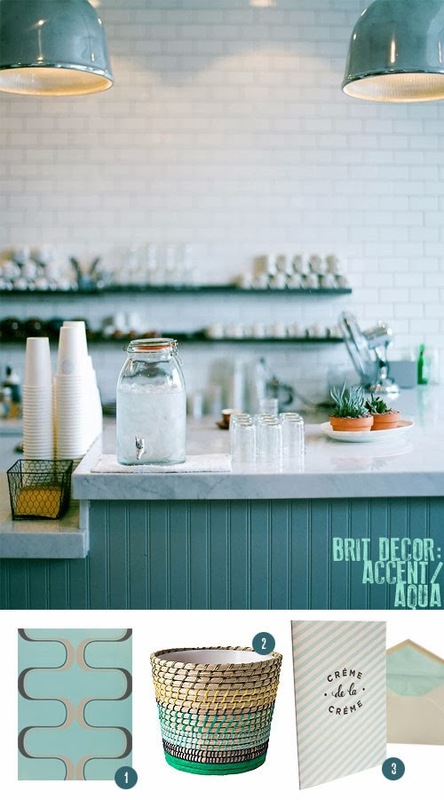 Aqua blues and turquoises are definitely in the family of accents that I would call upon to bring a fresh and uplifting look to a scheme - think of the beautiful waters of the Azure or a the sugar sweet freshness of a minted candy. The setting above shows the current trend in painted vintage dining chairs and I love how the vivid turquoise paint elevates the table setting as the centrepiece of the room. Note also how subtle flashes of vivid aqua blues in the wall print and the smokey green vase sitting on top of the drawers creates an extended palette of blues - perfection! Here's a great way of adding instant impact to any table with these Vintage La Solana Tumblers £25.33 (no1). I also love the freehand waves in the stunning Turquoise Seaside pillow cover (no.2) £34.82, and both are from Etsy. The charming Doughnut Cat illustration from Pussies on Parade for $20 also shows how delicious turquoise and pink can look together. Below, the Harlequin contour wallpaper from John Lewis at £46 (no.1) has the look and feel of a 1920's Deco style and the combination of turquoise and grey looks so sophisticated doesn't it? I was instantly charmed by the fun and quirky design of the Riskorn woven plant pot (no.2) at just £4 from IKEA, perhaps add a beautiful silvery green succulent plant to complete the aqua look. Finally and quite literally, the Creme De La Creme of today's selection is this letterpress greetings card at £3.95 from my favourite local stationer, Meticulous Ink. Which is your favourite colour accent?